This jolly building is No. 4 Percy Street, Fitzrovia (“it would be called Soho by a careless guide”), sometime home of Wyndham Lewis at the time he was writing Tarr. No blue plaque marks the site, although Charles Laughton and Coventry Patmore have plaques on the same block. Appropriately, the ground floor is now a boutique called “Almost Famous”, and the first floor houses a “brand development” company. A little further south, across Oxford Street, is Soho Square, where T.E. Hulme once hung Lewis from the railings after an argument got a little out of hand. “I never see the summer house in its centre without remembering how I saw it upside down.” According to Humphrey Carpenter’s biography of Pound, the dispute was about which man had bonking rights over Kate Lechmere, but I haven’t found corroboration for this anywhere else, and Carpenter had a habit of ascribing motivations to his subjects based on nothing more than his distaste for them. The statue is of Charles II. Despite his presence, there are no pelicans to keep down the rampant pigeon population. 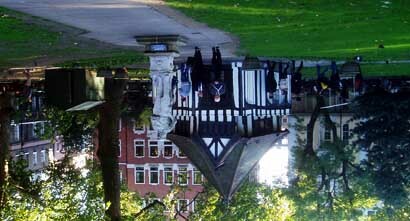 Soho Square is also the place where Hulme was once apprehended by the law for urinating in public, in broad daylight. Hulme was indignant: “Do you realise you’re addressing a member of the middle class?” The policeman apologised and went away. I looked, but couldn’t find a plaque to commemorate the event. Charles II died in 1685.